In historic downtown Lenoir City, on the block between Le Noir and Sparkly Pig. 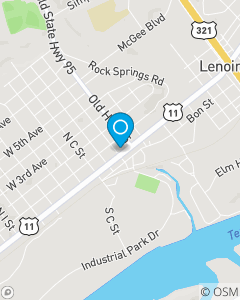 Our office goal is to be Lenoir City's first and preferred choice for insurance and financial services. We strive to be a good neighbor to every customer, every time, and make each visit a remarkable one. We provide and service you with Auto Insurance, Home Insurance, Health Insurance, and Life Insurance throughout Tennessee, including; Lenoir City, Loudon, Friendsville, Greenback, Kingston, Knoxville, Oak Ridge, Maryville and Alcoa.